Click here for details on this Africa hunt in July. 3 to 5-day all-inclusive Costa Rica July fishing trip with meals, lodging and boats starting at $1,985 per person. Click here for details on fishing in Costa Rica. This July hunt includes reception at Buenos Aires airport, transfers, all lodging during hunt, all meals and beverages, 1x1 guiding and trophy preparation. Click here for details on our Argentina stag hunt. Enjoy a summer pack trip vacation at one of Canada's most respected dude ranches. Fishing, hiking, horseback riding are all on the menu, as well excellent lodging, meals and hospitality. Click here for details on this Canadian getaway. Come hunt the "Big Five" with us. We offer dangerous game hunts in several African countries with a professional hunter with over 30 years experience. Click here for details on this Africa hunt. Cheyenne is our home and we know how to throw a little July rodeo. Come on out during the last week of July for concerts, cowboys, parades and pancakes. Click here for Cheyenne Frontier Days packages. 3 to 7-Day Fishing Packages from Thompson, Manitoba. 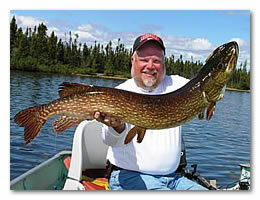 Great Pike and Lake Trout fishing all season long. Includes meals and lodging. Click here for details on this fishing trip. Bow hunt Africa plains game on over 6,000 acres set aside exclusively for archery hunters. Let us put together a custom package for the trophies that you want. Click here for details on July hunting in Africa.